Royal Shakespeare Company production Don Quixote is a bizarre experience, with an opening night that included a fire alarm and a food fight with the audience. Isn't that bizarre enough? Following its sold out in Stratford-upon-Avon in 2016, the show arrives in the West End and is centred around a (crazy or sane?) man named Don Quixote played by the wonderful David Threlf and his overweight noble steed Sancho Panza played by Rufus Hound. Don Quixote sets out on a hilarious journey across medieval Spain, defending the helpless and vanquishing the wicked. Throughout the story, the unlikely duo embarks upon a very odd adventure, filled with tales that would stretch everyone's imagination. Hound has the audience in stitches throughout: his interaction and his planned (or unplanned?) discussions with certain members of the front row are the high point of the evening. There are puppets, a big cast and music by composer Grant Olding with lyrics by author James Fenton: nice songs and a touch of flamenco. 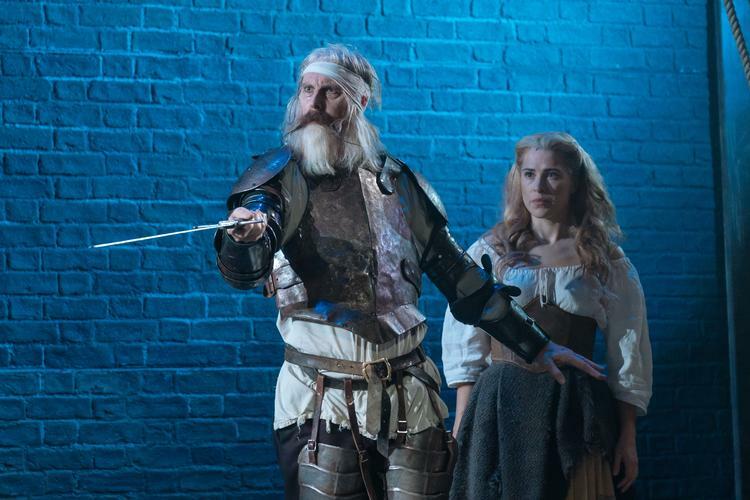 Don Quixote is indeed a long (160 minutes) show, but if you're keen for your mind to be stretched, and to have some good laughes, then make sure you head down to the Garrick Theatre. Don Quixote is adapted for the stage from Miguel de Cervantes' original novel by poet James Fenton. Produced by the Royal Shakespeare Company and Nica Burns, the production is directed by Angus Jackson. The production also features design by Robert Innes Hopkins, lighting design by Mark Henderson and sound design by Fergus O'Hare, with comedy direction by Cal McCrystal, movement by Lucy Cullingford, puppetry design and direction by Toby Olie and fight direction by Malcolm Ransom. It runs until 2 February 2019.